Christian Focus for Kids has a wonderful series of biographies for younger readers (ages 7- 14). The Trailblazers series is a fantastic way for children (and adults) to learn about the great cloud of witnesses who've gone before us, such as John Stott and Charles Spurgeon, and those who are still paving the way, like Joni Eareckson Tada. When CF4K announced the Trailblazer Extravaganza for the month of October, I was eager to participate. 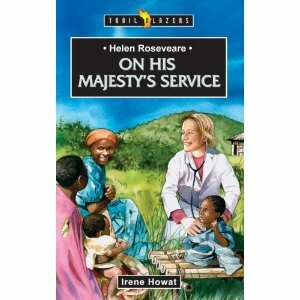 I chose to read Helen Roseveare: On His Majesty's Service. I confess that I'd never heard of Helen Roseveare before. I chose this particular book because she was a missionary in the Belgian Congo in the 1960s, which is the setting for a book I recently read, The Poisonwood Bible. I was curious to know if the fictionalized account of a missionary family in the Belgian Congo during that time was accurate. From the first pages of On His Majesty's Service. I was drawn into the account of the English girl born during WWII who decided early on in life to become a missionary. Helen studied to be a doctor and went on to serve many years in the Congo, in spite of political unrest that led to her capture and imprisonment for several months. The work the Lord accomplished through her is an amazing testimony to His power. Helen's love for the people of the Congo, her steadfastness in the face of great odds, and her unwavering faith in the Lord are a great example for children and adults alike. On His Majesty's Service is a well-written and interesting book. Even though the Trailblazers series is targeted to children, I highly recommend them for adults. Thanks to Christian Focus Publications for allowing me to read this great book. Thanks for being a part of the Trailblazers Book Review Extravaganza. We're so glad you've finally gotten acquainted with Dr. Helen. If you'd like to learn more about her life, you can see a full list of books we publish by Helen Roseveare here: LINK.